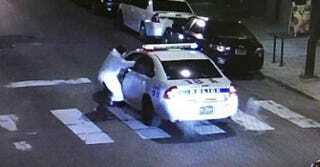 A Philadelphia police officer was wounded Thursday night after being shot multiple times in what, according to police, the shooter has confessed was an “attempted assassination” “in the name of Islam,” NBC 10 reports. The shooter, identified as 30-year-old Edward Archer, fired at Police Officer Jesse Hartnett 13 times as the officer drove through West Philadelphia late Thursday night, Philadelphia police detailed. Hartnett was hit three times but managed to return fire and hit Archer, all while calling for help. Archer, who is from Yeadon, Pa., was treated for a gunshot wound to his backside and then released into police custody. Police said that Archer told investigators the shooting was on behalf of Islam, and that he did not name anyone else in connection with the attack. “He certainly was targeting police," Ross said. “He was trying to assassinate this officer. “You can see him from across the street; he had already started firing … with one aim and one aim only, and that was to kill [the officer],” the police commissioner added. According to NBC 10, Philadelphia Mayor Jim Kenney was quick to commend the Police Department for its quick action, while maintaining that the attack should not be used as some larger example of Islam. “This is a criminal with a stolen gun who tried to kill one of our officers; it has nothing to do with being a Muslim,” Kenney insisted. The gun used to shoot Hartnett, a five-year veteran on the force, was reportedly stolen from an officer’s home more than two years ago. The officer that it had belonged to was reprimanded for the theft. “We know it was stolen. How many hands it passed through in the past few years, I have no way of knowing,” Ross said. In the meantime, Hartnett, who was hit three times in the arm, was in stable condition but is expected to face a long recovery.